Most women experience symptoms of bloating, fatigue, cramps, headache, digestive problems and mood swings before and during their menstrual cycle. One of the best ways to prevent and treat these symptoms is via a healthy diet, which can also aid general health and overall well-being. The high fiber content of beans and peas reduces the congestive symptoms of cramps by producing bulkier stools with higher water content. This rids the body of excess fluid and also normalizes digestion, reducing both constipation and diarrhea, according to Dr. Susan Lark, director of the PMS Self-Help Center in Los Altos, California, and author of “Dr. Susan Lark's Menstrual Cramps Self Help Book.” Legumes are also a good source of B vitamins, which prevent cramps and menstrual fatigue. Although beans can create excess gas, this can be minimized by eating small amounts and increasing slowly, or by taking a digestive enzyme like Beano. Green vegetables are high in calcium, magnesium and potassium, which relieve and prevent the spasms that lead to cramping pain. Lark also adds that these minerals can calm and relax emotions, reducing irritability. Dark green vegetables also contain high amounts of vitamin K, which is needed to coagulate blood and prevent excess bleeding. A group of hormone-like substances in the body called prostaglandins are involved in muscle contractions and menstrual pain. One way to shut down the prostaglandin effect is by consuming omega-3 fatty acids like those contained in salmon, walnuts and flaxseed. A 1995 study in the “European Journal of Clinical Nutrition” found that women whose diets are balanced in favor of omega-3s, rather than other fats, tend to have milder menstrual symptoms. A report from Dr. Phyllis Johnson, of the U.S. Department of Agriculture’s Human Nutrition Center in Grand Forks, North Dakota, found that young women who consumed low amounts of manganese had an increased menstrual flow of up to 50 percent, leading Johnson to recommend that women with menstrual discomfort increase their manganese consumption. 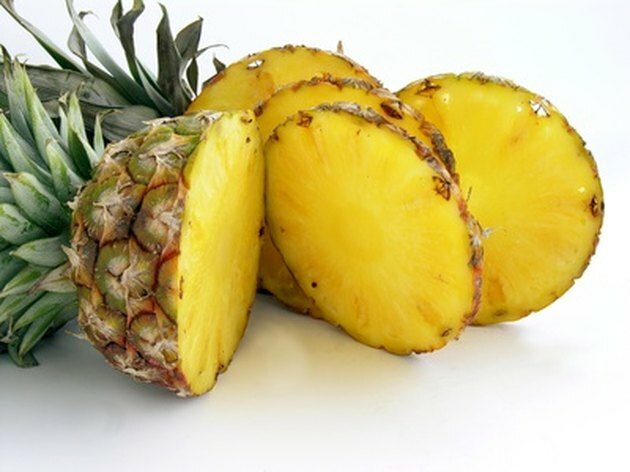 Fruits are high in manganese, but one of the richest manganese food sources is pineapple. Pineapple also contains high levels of bromelain, an enzyme thought to help relax muscles and therefore prevent menstrual cramping. Tea is another source of manganese, according to Johnson, although women should avoid the caffeinated version, which can actually lead to greater menstrual discomfort. Ginger tea may be helpful in relieving nausea and bloating, and chamomile tea also contains properties that relieve muscle spasms and reduce the tension that can lead to anxiety and irritability. Excessive fluid retention is one of the main causes of congestive symptoms seen with cramps, which are characterized by dull, aching pain. One of the very best ways to help decrease water retention, even though it may seem counterintuitive, is to increase water consumption--if a woman isn’t drinking enough, her body may overcompensate by retaining extra water. A study by British doctors found that eating small amounts of carbohydrates every three hours and within one hour of going to bed combated PMS symptoms in 70 percent of women. Dr. Lark adds that whole grains are excellent sources of magnesium, which reduces neuromuscular tension. Whole grains also have B-complex vitamins and vitamin E to combat fatigue and depression. Yogurt contains live and active cultures of bacteria that promote a healthy digestion. Yogurt is also a good source of calcium, and getting twice as much calcium as an average women consumes on a daily basis, 1,300 milligrams instead of 600, seems to alleviate menstrual discomfort, according to James G. Penland, Ph.D., a psychologist at the Department of Agriculture. However, since meat and dairy products contain arachidonic acids, which increase the production of cramp-causing prostaglandins, women may prefer to choose nondairy forms of calcium such as broccoli, kale, canned salmon with bones and calcium-fortified foods like cereals and juices.